So, its come to this. I’m making up words now. My college writing professor would either be ashamed or delighted, depending on her mood. But if anything is worth butchering the English language for, its this meal. Jamie Oliver has wormed his adorably-mop-headed British way into my heart as a chef who really knows his way around good, simple, honest food. J bought me “Jamie at Home”, the companion book to his show of the same name, for Christmas last year, and although we’ve only tried a few of the recipes they’ve all been winners. (The “Hot and Sour Rhubarb and Crispy Pork with Noodles” on page 58 is a particular hit, but that’s a post for another day.) But so far, my absolute favorite recipe from the book is his “Incredible Smashed Peas and Fava Beans on Toast” from page 156, and it was the star of this supremely summer meal. 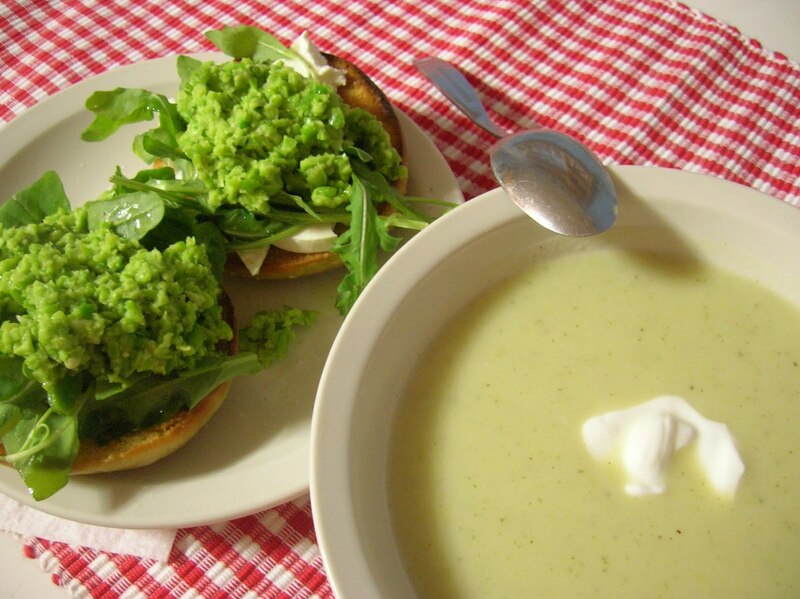 There’s very few things quite as delicious as a bowl of homemade soup and some crusty bread, and our hot-weather take on this common pairing consisted of smooth and creamy vichyssoise and Jamie’s fava and pea crostini. Cool, fresh, light, and beautifully green, this meal was both satisfying and refreshing on a muggy August evening. I made the vichyssoise based on this recipe from Epicurious, and made it the day before we intended to eat it so that it could chill and the flavors blend thoroughly. I made some changes to make it a bit healthier, and to account for the fact that I’d only bought one leek (oops!). I sauteed the white and light green parts of the leek as per the recipe, but reserved the tough dark green tops to infuse the broth later and inject more leeky flavor into the soup. I also added an equal amount of white onion to ramp up the oniony sharpness and better balance the starchy weight of the potatoes. I used a good amount of white pepper instead of black for an earthier kick, and used non-fat Greek yogurt in place of the milk and cream which gave the soup a delicious, though probably non-traditional, tang. I also had to skip the chives because I didn’t have any, but I don’t think that the soup suffered much for it. 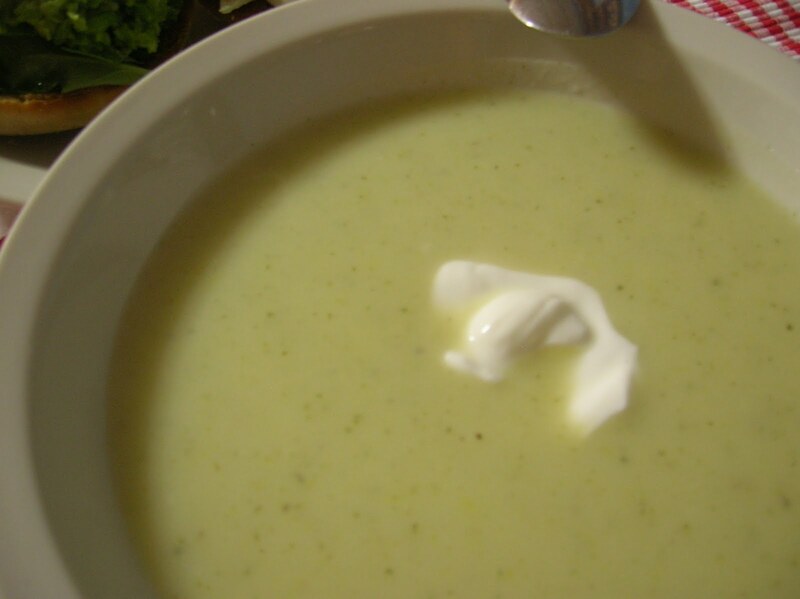 This vichyssoise is surprisingly light while also being creamy, satisfying, and flavorful. The finished soup was cool, creamy, smooth and savory, with just a bit of heat tingling on the tip of the tongue. It could have used more leek, obviously, but its hard to imagine a better soup on a hot day. Except, perhaps, a simple cold tomato soup, but we’ve been over that already. But really, I’d be lying if I didn’t say that the soup, as good as it was, paled in comparison to these simple, vibrant green toasts. 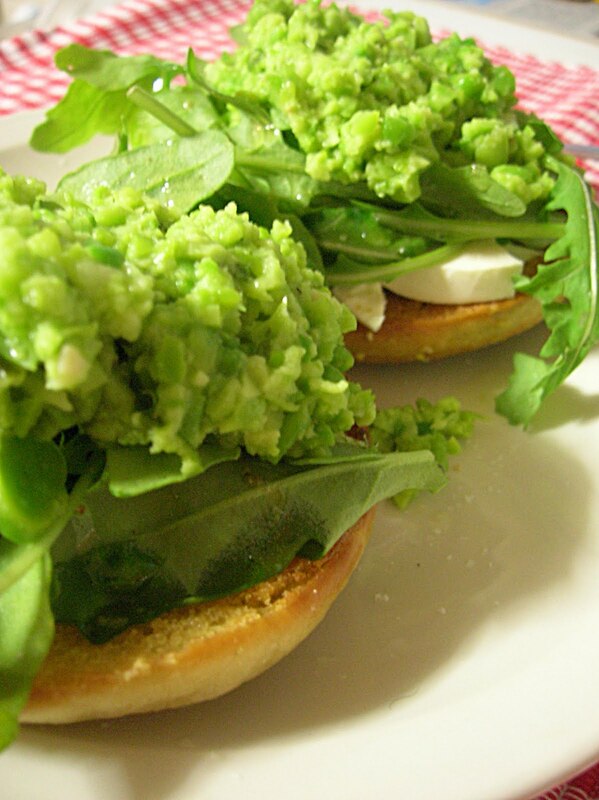 These rustic smashed peas and fava beans are now one of my favorite warm weather treats. The base of the toasts were homemade English muffins (I’ll need to make these again so I can blog about them too – they’re shockingly easy and perfectly delicious! ), split and toasted and brushed with extra virgin olive oil. Thick slices of fresh, lightly salted mozzarella topped the bread, followed by a tumble of fresh, peppery arugula dressed simply with EVOO, kosher salt and coarse cracked black pepper. Then the whole thing got topped off with a big spoonful of the fava and pea mash, made with the aforementioned beans (this really needs to be made with fresh peas and favas – their bright sweetness just sings here – but since I had neither and frankly didn’t feel like buying and then shelling enough of them to make this meal, I made do with frozen. It was still excellent.) coarsely pureed with lemon juice, EVOO, salt, black pepper, fresh mint, and a bit of parmesan. Biting into one of these babies is a little taste of heaven. Sweet, verdant, peppery, and lightly creamy; the smooth mozzarella, tender but lightly textured mash, crisp greens and crunchy bread… I could eat this every day. Its got a little bit of everything, the perfect blending of flavors and textures. And despite its lightness, its surprisingly satisfying. A few of these would make a wonderful lunch all on their own. But paired with a bowl of vichyssoise and a glass of chilled, dry white wine, it was an excellent summer dinner, one I hope to repeat in the very near future. This entry was posted in Food, Drinks and Cooking, Table for Two? Archives and tagged beans, cheese/dairy, potatoes, soup, vegetables. Bookmark the permalink.